This product has an evolving taste. It evolves with each walk around the block. How ’bout some special sauce on those? Get a 5 pack, experience all the new flavours. 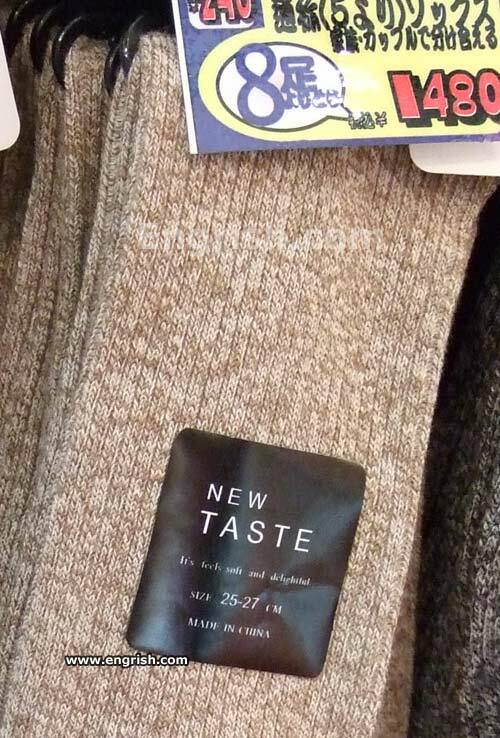 In fact, the new taste wasn’t such a hit with customers who complained that it was tasting like the competitors, and they had to reintroduce “Socks Classic”. Hmmm, it;s got a heady aroma, a wooly texture, with a supple finish…Argyle ’62 from the South of Bordeaux. Now with Reinforced Toe that Holds In The Flavor! Now has 50% of your recommended daily levels of dietary fibers! Quentin Tarantino seal of approval. I caught my Burmese cat one night, laying there with a far away look in his eyes, whilst chewing on one of my daughter’s dirty socks. My assumption was that he thought he had found a dead rat.. These ones must be pre-flavoured. Bottomline reads — Strictly no trying! If it’s delighted, well, then I’m about to happy! I love to feel delicious. Sock fetish delight – anybody ? The cocoa powder really adds to this polyester blend. The taste and smell are enhanced with each wear. My doggie just loves to sink his teeth into them! They’re marketing to moths now? Socks! They’re not just for perverts any more! For those who always end up sticking their foot in their mouth. This brings out the feels. Not only soft, but delightful too? Wow! It’s hard to find socks that are both soft AND delightful!